A guitarist and composer, born in Passo Fundo in 1980, Yamandu began studying guitar at the age of 7. Until the age of 15, his only musical school was the folk music of the South of Brazil, Argentina and Uruguay. Yamandu plays Brazilian classical music, but he is also a gaucho full of milongas, tangos, zambas and chamamés. A guitarist and composer who does not fit into any musical chain, he is a mix of all styles and creates rare personality interpretations on his 7-string guitar. Yamandu lives up to the meaning of his beautiful name “the forerunner of waters”. 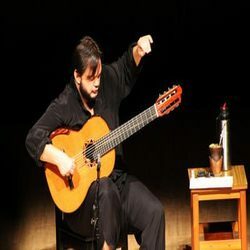 Considered one of the greatest talents of the Brazilian guitar, Yamandu Costa is a world reference in the interpretation of our music, which dominates and recreates each performance, including in his compositions. His musical creativity develops freely on an absolutely improved technique, exploring all the possibilities of the 7-string guitar, renewing old themes and presenting his own compositions of intense brilliance, in an always passionate and contagious performance. In 2012 in Cuba he won the Cubadisco International Award for CD Mafuá and a Mention of the ALBA Award for CD Lida. Yamandu Costa is currently the most represented Brazilian musician abroad, covering various countries of the globe: France, Portugal, Spain, Belgium, Germany, Italy, Austria, Switzerland, Liechtenstein, Monte Carlo, Holland, Sweden, Norway, Finland, Estonia, Slovenia, Russia, Lithuania, Serbia, USA, Canada, Australia, India, China, Japan, South Korea, Greece, Macedonia, Czech Republic, Israel, Cyprus, Zimbabwe, Cape Verde, Angola, Reunion, United Arab Emirates, Kuwait, Tunisia, Iran, Ecuador, Cuba, Colombia, Chile, Argentina, Uruguay, Paraguay and Costa Rica.